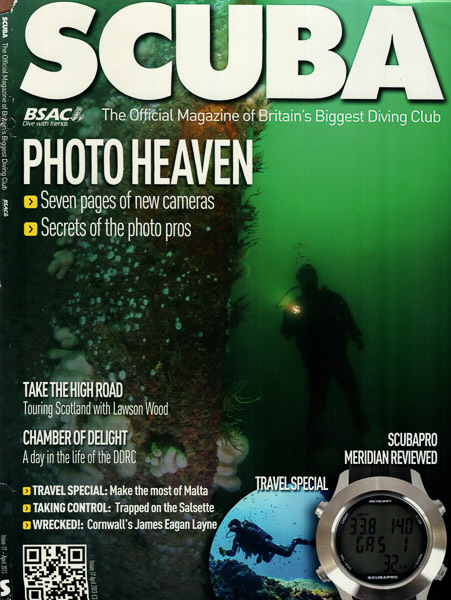 I’m really proud to be asked for an image to adorn the cover of Scuba magazine this month (Issue 17, April 2013). I was approached to provide an image specifically of the wreck of the James Eagan Layne, a liberty ship torpedoed by U-339 in 1945, which came to rest on the seabed in Whitesand Bay, just West of Plymouth. This is a site I know really well and have many images of. I chose this image, which was taken in June 2005 at the bow, looking up with my underwater photography buddy, Trevor Rees acting as a model. It was shot using a Nikon D100 camera with Nikon 10.5mm fisheye lens and lit with dual Sea & Sea YS-90 strobes, at a depth of probably 15-20m. 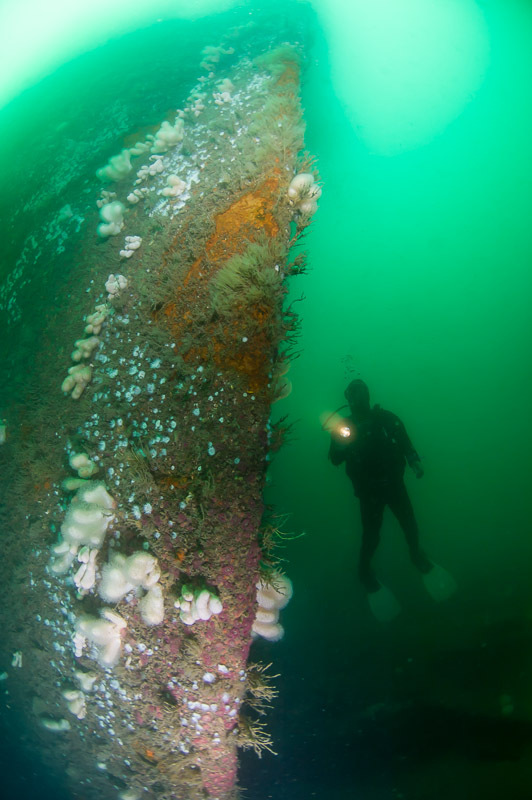 The shot shows the vertical profile of the bow, which is well encrusted with marine life, particularly dead mans fingers (Alcyonium digitatum). I was very pleased to get a pleasant green tone to the water; often when looking up towards the surface, unpleasant artefacts are produced as the camera struggles to cope with the dynamic range. I have avoided this by not facing towards the sun and because I am quite deep.